TouchGrove’s original LED Football ( ) was a loving homage to Mattel Football—the classic handheld LED-equipped computer game that gamers of a certain age (those of us in our 30s) remember from our childhood in the 1970s. Priced at only $1 (and free this weekend in honor of the Super Bowl), it’s silly not to get this, if you have any nostalgic bone in your body. Go Deep: On the heels of LED Football, touchgrove has produced LED Football 2, which like the Mattel Football 2 handheld game that inspires it, adds passing to the mix. This isn’t Madden or any other hifalutin 3-D American football game. Instead, touchGrove sought to recreate one of the earliest handheld computer games I can remember—back when CHIPs and Charlie’s Angels ruled the airwaves, when Garanimals and Toughskins were all the designer clothes that grade-school kids needed. Back then, long before the era of the Game Boy, handheld games used red, LED-based displays not unlike old calculators. They lacked pixilated graphics or any sort of 3-D capability, were hard-wired to play only one game and could only make rudimentary sounds. But for many of us, this was a formative experience. If you played the original LED Football, you probably noticed a few glaring omissions from basic gameplay: There was no way to run backwards, behind the line of scrimmage, for example, and there was no passing game. It was all about running with the ball, punting or kicking it for a field goal. That stayed true to the handheld football game upon which the original LED Football was based. 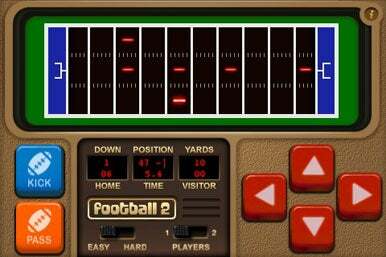 Similarly, LED Football 2 draws its inspiration from Mattel Football 2, Mattel Football’s successor, which also sported a passing game and better quarterback movement. touchGrove’s attention to detail and desire to recreate that old-school handheld game experience is, without question, the big draw of this game—playing it, you can’t help but feel like you’re holding a plastic game in your hand, something powered by a 9-volt battery. If you click on the info link in the game, you’ll get some basic instructions on a label that even looks like the worn underside of an old handheld game system. LED Football 2 is a love-letter to those games many of us older farts remember for our youth. The game even features what touchGrove calls “Wear-Down” technology—the more you play, the more worn down the buttons will appear to get. My only complaint is that LED Football 2 doesn't save games in between interruptions, so if you're unable to complete a game before you hit your home button, you'll have to start over from the beginning again. Options consist of two toggle switches on the game’s interface, an Easy and Hard setting and one or two player modes. (Players pass the iPhone back and forth in that mode.) If your volume is on, you’ll hear some blips and beeps too. That’s it, but that’s all we had back in my day, and dadgum it, we liked it that way! LED Football 2 is compatible with any iPhone or iPod touch running the iPhone 2.x software update.